For All JKSSB Lab Assistant candidates, here is the Good News. Jammu & Kashmir Services Selection Board has invited the applications for JKSSB Lab Assistant Recruitment 2018-19. So, Candidates can check out the complete details of JKSSB Lab Assistant Recruitment 2018 on this following page. Also, Candidates can check JKSSB Lab Assistant Recruitment 2018 details on this page in a table format. Also, Download JKSSB Lab Assistant Syllabus and JKSSB Lab Assistant Exam Pattern 2018-19 in PDF Format from the following page. And Get the details of JKSSB Lab Assistant Exam date, JKSSB Lab Assistant Admit card 2018, JKSSB Lab Assistant Result date, etc. And Check JKSSB Lab Assistant Selection Process, Job Location, etc from the following page. 1.4 How To Apply For JKSSB Lab Assistant? The details are given in the table regarding JKSSB Lab Assistant Recruitment and candidates are advised to have a look through it. Also, details such as Job Location, Exam Mode, and others. Also, we have included JKSSB Lab Assistant Previous Papers, JKSSB Lab Assistant Syllabus for your reference. Hence, candidates are advised to go through the complete page to get all the materials. Also, there are details for JKSSB Lab Assistant Application Form, Eligibility which you will require for your reference. Above all dates given are tentative and can be changed. Hence, it is advised to go through the JKSSB Lab Assistant official website to get all the details. Here we will also be updating details for JKSSB Lab Assistant updates for candidates reference. 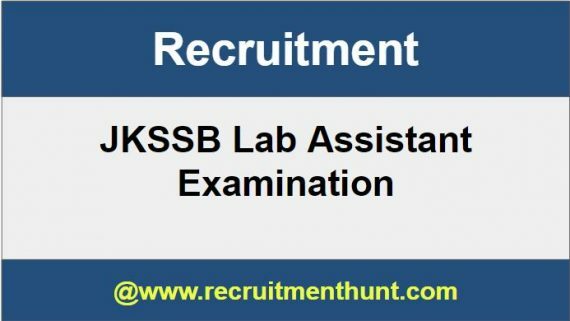 Before applying for JKSSB Lab Assistant Recruitment candidates must go through these details. Educational Qualifications The candidate is required to be 10+2 with science or equivalent from any recognized University/Board. Candidates have to pay INR 350 once the filling of JKSSB Application Form is done. No interview or viva will be conducted for this post. Candidates will be selected on the basis of merit obtained in written test. All the selected candidates will get the JKSSB Lab Assistant Pay Scale as per the norm of the Organization. Also, all will be getting the pay slip of Lab Assistant. How To Apply For JKSSB Lab Assistant? Applicants are first required to go to the said Portal and register themselves by clicking on “New User? Register here” link. After creating login credential, candidates need to log in with these credentials and are required to fill in their complete information by clicking on Profile Creation Link. After login with credentials, a candidate can see active advertisements under Online Application Link. Click Here to apply link is available next to active advertisements after login. Only the Application of candidate fulfilling eligibility conditions will be accepted by the system.